A few years ago, Patagonia released the Nano-Air Hoody, a mid layer that insulated like a traditional synthetic puffy jacket but that breathed much better. Since then, many companies have released their own versions of “active insulation” pieces (check out our layering article for more on active insulation). The Ventrix Hoodie is The North Face’s entrance into the active insulation market, and they say it is “designed for highly aerobic activity in variable weather conditions.” Competing against the Patagonia Nano-Air series, various Polartec Alpha pieces (like the Outdoor Research Ascendant), and other proprietary active insulators, the Ventrix has some stiff competition. The North Face has been talking a pretty big game about the Ventrix, so I was eager to see how it compared to the rest of the market, and where it fit into the spectrum of active insulators. I think the Ventrix has a very versatile fit. 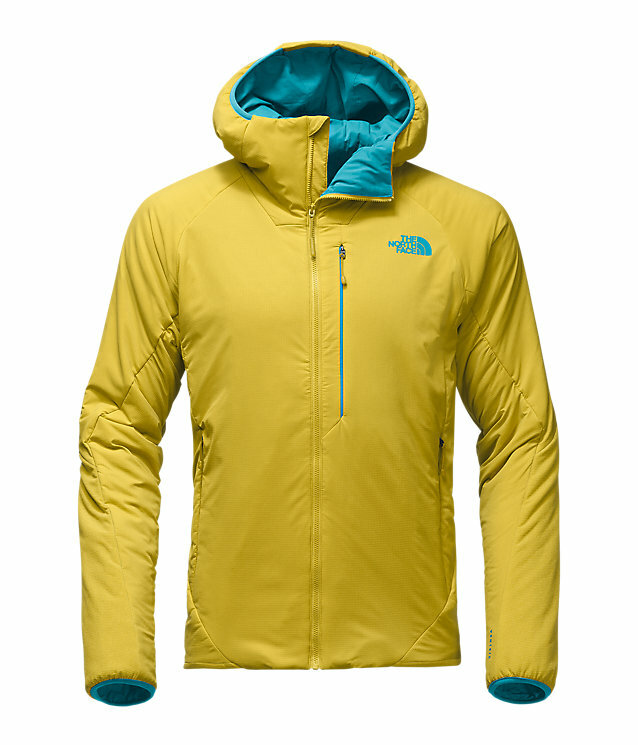 It is certainly a bit roomier in the torso than the Patagonia Nano-Air Light Hoody and touch roomier than the Ascendant. This allows for more layers underneath and better range of motion. Usually I find myself liking very slim cuts, but the Ventrix is a well thought out, more generous silhouette. I like it. The hood on the Ventrix is small and works well under a helmet. It isn’t skin tight though, so it can be worn over bulky hats — but not comfortably over a helmet. Over a bare head, the hood is a bit large, and I wish there were adjustments to keep it out of my eyes. 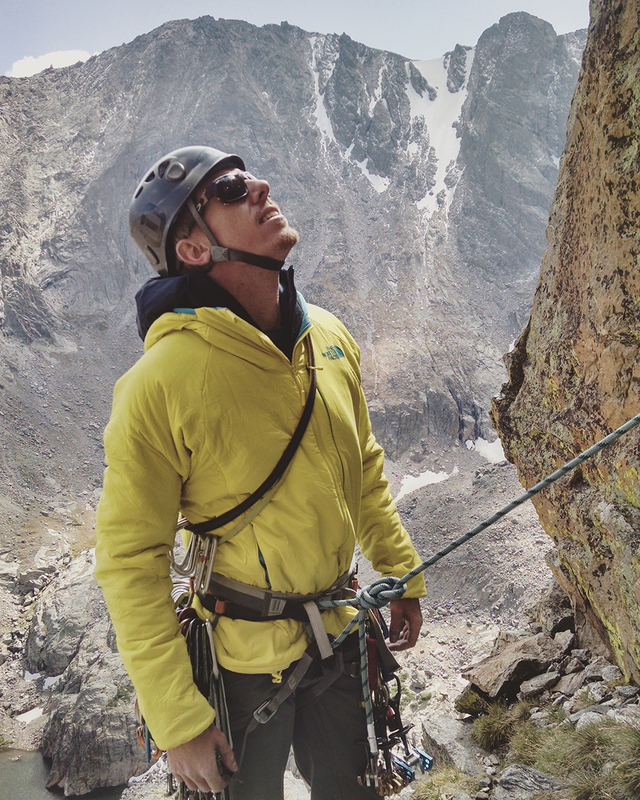 Sam Shaheen in The North Face Ventrix Hoodie, Rocky Mountain National Park, CO. The sleeves on the Ventrix are cut longer than both the Ascendant and the Nano-Air light. Though the sleeves and cuffs lack the streamlined elegance of those on the Nano-Air Light, I find the Ventrix’s longer sleeves to be a bit more functional, since they are long enough for me to pull my hands into if it gets cold or windy, especially at a belay. The overall length of the Ventrix is about the same as the Ascendant, and a touch longer than the Nano-Air Light. It stays tucked under a harness pretty well, but it will come untucked during large reaches or tool swings. The key material in this jacket is the Ventrix insulation. This insulation is similar to the Nano-Air insulation — it is a stretchy synthetic insulation that is held between a face and liner fabric. The 80 g insulation used in the Ventrix actually feels like it falls between the Nano-Air Light (40 g FullRange insulation) and the standard Nano-Air (60 g FullRange insulation) in weight and warmth. I can often wear the Nano-Air Light on strenuous tours in cold weather, but I often overheat in similar conditions in the Ventrix. I can’t say if the insulation actually works like The North Face claims, but I can say that the Ventrix breathes impressively well — more on this in the breathability section. The face fabric on the Ventrix had an odd hand feel when it was new. It almost felt rubbery. This feeling, however, quickly faded with use. The face fabric is light and quite hard wearing. I’ve been up many pitches of alpine granite in the Ventrix and it still looks brand new. I think the Ventrix excels as an on-route alpine climbing insulator, though I’m not sure it would hold up to repeated high-abrasion use over several seasons — it is still a lightweight jacket that isn’t designed for maximum durability. The lining fabric is a bit lighter than the face fabric, and is perforated at the back and underarm for increased breathability. It is comfortable against the skin. The Ventrix is pretty light on features. There are two zippered hand warmer pockets and a zip chest pocket. The hand warmer pockets are low on the jacket, so they aren’t that useful when wearing a harness. This makes the jacket much more comfortable for casual use, but if you need lots of pocket space on route, it is something to consider. The chest pocket is quite large. The zipper opens up pretty much the full length of the pocket, which allows stuff to fall out of the pocket if the zipper is down and you lean forward. This is slightly annoying, but you just have to keep the zipper shut to avoid any issues. At our measured weight of 427 g for a Medium, the Ventrix is on the heavier end of midweight insulators. However, keep in mind that most insulators we consider to be “midweight” are puffy down or synthetic insulators that have essentially zero breathability (and very lightweight constructions). The Ventrix is about 120 g heavier than the Nano-Air Light, but offers an edge in warmth and a full zip silhouette with hand warmer pockets. The Ventrix is also about 70 g heavier than the Outdoor Research Ascendant, but is much more comfortable and offers better range of motion. The regular Nano-Air Hoody has a stated weight about 40 g lighter than the Ventrix, which puts both pieces in the same weight class. They have similar feature sets and though I haven’t worn the non-Light Nano-Air enough to make direct comparisons, I expect them to perform very similarly. I would hazard a guess that the Nano-Air is a touch warmer and a bit less breathable. As with everything in life, it’s all about trade offs. Yes, the Ventrix is a bit heavier than some of its competitors, but with that added weight comes a more versatile product. A full front zipper, zipped hand warmer pockets, and a chest pocket with a roomier fit for layering. Weight isn’t always everything, and I’ve found myself reaching for the Ventrix more and more as I’ve had it. The Ventrix is not designed to fend off heavy weather. It is designed to insulate and breathe. That being said, it does a decent job of repelling precipitation and blocks some wind. When alpine climbing this fall in Rocky Mountain National Park, I often found myself in the Ventrix on windy, exposed belay stances. In moderate winds (less than about 20 mph), you can definitely feel the wind coming through the Ventrix. In these situations, I would often reach for a shell to block the wind. In lighter winds, the Ventrix fares ok, but it definitely is not designed to block wind. In windy and cold conditions, you’ll probably want to toss on a shell. The Ventrix blocks a touch more wind that the Nano-Air Light, and a similar amount as the Ascendant. I also skied a few days in the Ventrix in very cold storm conditions. In one-inch-per-hour snow, the DWR on the Ventrix couldn’t quite keep up, especially with the heat I was generating from making quick laps. A build-up of melted snow on the shoulders and arms quickly turned to ice. Sam Shaheen in The North Face Ventrix Hoodie, Front Range Backcountry, CO.
Because it was so cold, the ice stayed ice and I stayed dry, but in warmer conditions, I would have been wet for sure. The Ventrix does fine in lighter snow and very light rain, but in most snow and rain situations, I would add a hard or soft shell. Though not quite as breathable as the more minimal and thinner Nano-Air Light, the breathability of the Ventrix is quite impressive. For reference, I find that most active insulation pieces tend to be a bit on the warm side for me, but I do run a bit warmer than most. I appreciate the full zip of the Ventrix for dumping extra heat and putting it on and off frequently. 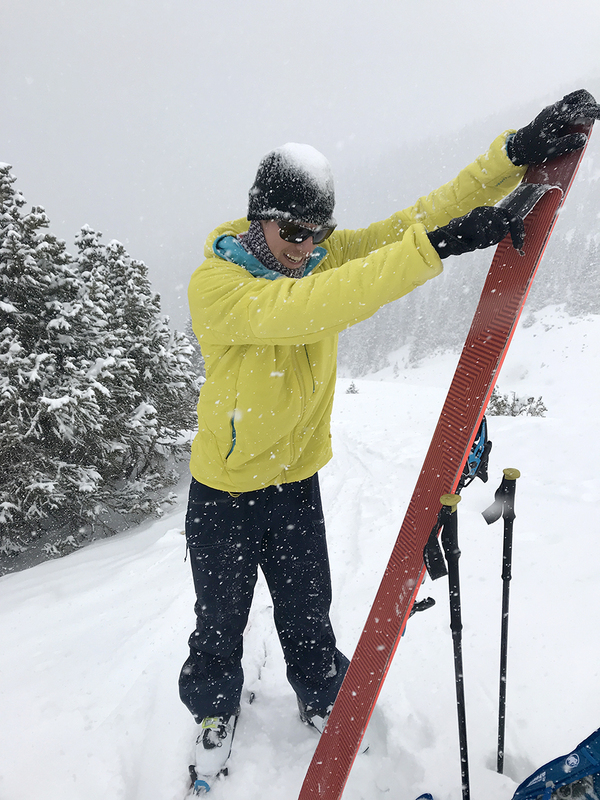 For moderate exertion in colder temps (20-30°F and slow skinning, for example), the Ventrix breathes well enough to leave on all day (with a shell on for the descents). If I increase the skinning pace, I’ll typically overheat though. For spring and fall alpine climbing (stop and go activity that is rarely high output), the Ventrix really shines. It’s feature set and reasonably light weight compliment the high alpine of Colorado, and in 40-50°F temps (as long as the wind is light), it can be an all-day insulator for long alpine climbs. I was very impressed by the Ventrix as a climbing piece. After about 20 days of use for everything from coarse granite multipitch climbing to snowy tree skiing and out at the bars, the Ventrix still looks brand new. I am impressed by the durability of the fabric but I will definitely update this review if any durability issues arise. The Ventrix is ideal for someone who wants to own a single active insulation piece to cover all of their outdoor activities. It is competitively priced, breathes about as well as its competitors, and has a full featured silhouette. As the active insulation market continues to expand, it becomes more interesting and also more difficult to pick between the various options. Each piece has its own specific benefits and drawbacks, but in the end, I’ve found myself reaching for The North Face Ventrix Hoodie more and more. It has a useful feature set, an athletic (but still roomy) fit, and breathes quite well. If you do a lot of stop-and-go activities or need a new midweight insulator that breathes better than a traditional puffy, definitely check out the Ventrix. How are the shoulders on that thing? TNF stuff is undersized in the neck and shoulders, in my experience. Hey Chris, I think the shoulders and neck on the Ventrix feel pretty good and consistent with the fit of the whole jacket. The Ventrix is carried in shops pretty heavily, so if you’re worried, there’s a good chance your local shop will have one you can try on. What would you say the differences are between this and the nano air? *Nano-Air light that is? I had a nano air but it was too warm for skinning. It seems that you have some experience with the nano-air light. Which of these two pieces would you say is more versatile? I like the nano-air light as far as the insulation goes, but wonder if this Ventrix would be more of a quiver killer piece. Thanks! Hey Lee, I think the Ventrix is a touch warmer than the Nano Air light but from a feature perspective, the Ventrix is much more versatile. It has hand warmer pockets and a full front zip while the Nano Air light is a very minimal piece with a half zip and only a single chest pocket. Like the Ventrix it comes with full-zip and zipped hand pockets (but under hip belt/harness unfortunately), as well as a even thinnner and less wind resistant back(waffle-knit). Since most of your back is covered by your pack, this acts as venting zones along the side of your back and under arms. It is still lacking the chest pocket, which I do miss.